Many business owners talk about disruption in their industry, but it’s not easy to know how to deal with it. The best business owners consider many future scenarios in their strategic planning, and create strategic plans in the face of these disruptive forces. How clearly do YOU align your business strategy with future trends? 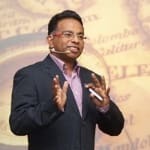 Gihan Perera is a futurist, conference speaker, author and consultant who gives business leaders a glimpse into what’s ahead – and how they can become fit for the future.